In 1876 in the village of Pellevoisin, Estelle Faguette lay dying, at the age of 33, of pulmonary tuberculosis, acute peritonitis and an abdominal tumor. On the 10th of February 1876, one of the doctors consulted, Doctor Benard of Buzançais only gave her a few hours to live. During the night of the February 14th, she claimed to witness the first of fifteen apparitions of the Blessed Virgin and was healed. Estelle Faguette was born at St. Memmie near Châlon-sur-Marne. Doctor Benard of Buzançais only gave her a few hours to live. She was suffering from pulmonary tuberculosis, an acute peritonitis and an abdominal tumor. The first apparition. A demon appeared at the foot of her bed but Our Lady rebuked him and he immediately departed. Our Lady then looked at Estelle and said to her: "Fear nothing, you are my daughter." Mary told her to have courage for she was to suffer five more days in honor of the five wounds of Christ. On Saturday she would either be dead or be cured. The Virgin appears again with the demon and promises her safety and healing. Mary showed her the history of her past sins and she was overwhelmed with sorrow. The Virgin appears for the third time and exhorts her to courage and reminds her of Her Mercy. She revels in a letter that Estelle had given her. The Virgin appears for the fourth time and tells Estelle: "I am all merciful and hold sway with my Son" as well as " Have courage, patience and resignation; you will suffer and will not be free of troubles; try to be faithful and make known my glory"
The Virgin appears for the fifth time and asks Estelle to be faithful to Her. When Mary disappears, she encounters great pain and suffering but offers it to God. Her right arm remains numb but gains use of it later when a priest suggests it will be healed for her to make the sign of the cross. The Virgin appears for the sixth time. She is completely surrounded by light and dressed in white. She looked at something, crossed Her hands over her chest and smiled saying: "Stay calm my child, patience, it will be difficult for you, but I am with you". She said "Courage, I shall return". and then disappeared again. The Virgin appears for the seventh time. She entrusts Estelle with a secret. The Virgin appears for the eigth time for only a short while. "I want you to be calmer, more peaceful, I have not told you which day or hour I shall return, but you need rest"
The Virgin appears for the ninth time and reprimands her for not being calm enough to accept a visit from her. " I could have come again yesterday; you deprived yourself of my visit because I was waiting for an act of submission and obedience from you." The Virgin appeared briefly for the tenth time saying: "They should pray; I will set them an example"
The Virgin appeared for the eleventh time to inform Estelle that she was to live. She told her: “I CAN STOP MY SON NO LONGER” and "France will suffer"
The Virgin appeared for the twelfth time. She stared, as usual, at some invisible object; then looked all around, said nothing and left. The Virgin appeared briefly for the thirteenth time. She told Estelle: "I have chosen you. I choose the meek and mild for My glory. Be brave, your time of trails are about to commence." The Virgin appeared briefly for the fourteenth time. She exhorted Estelle to make many more scapulars. The Virgin appeared for the fifteenth and final time. She offered Estelle the chance to kiss her scapular and informed her that she was chosen "to proclaim my glory and to spread this devotion". She instructed her to go to the Prelate to promote the design and usage of her scapular. Mgr de La Tour d'Auvergne, archbishop of Bourges, receives Estelle and authorizes the making of the scapular. The Archbishop of Bourges allow public worship at Our Lady of Pellevoisin and Estelle's room is transformed into a chapel. Mgr de La Tour d'Auvergne receives Estelle at Bourges. Mgr de La Tour d'Auvergne orders the second Canonical Inquiry. All the witnesses are favorable. Death of Mgr de La Tour d'Auvergne before he had time to conclude the Inquiry. With the authorization of Mgr Marchal, Fr. Salmon parish priest of Pellevoisin accompanies Fr. Auvrelle (vicar general) to Rome and presents to Leo XIII the bound account of the apparitions with a picture of Our Lady of Pellevoisin. Leo XIII by a Motu Proprio grants indulgences to encourage the pilgrimage to Pellevoisin. Pope Leo XIII approves the Archconfraternity of our Mother All Merciful of Pellevoisin. Second private audience of Estelle with Leo XIII who promises her to submit her scapular of the Sacred Heart the next day to the Congregation of Rites for the drawing up of the decree of recognition. The Congregation of Rites issues a decree on granting approval to the Scapular of the Sacred Heart. Estelle Faguette died in Pellevoisin at the age of 86. Monsignor Paul Vignancour creates a medical commission charged with the study of Estelle Faguette's medical records. Monsignor Paul Vignancour recognizes the miraculous cure of Estelle Faguette. No images currently availble from Pellevoisin. The blessed Virgin completely was surrounded by light and dressed in white. She would appear with arms outstretched and wore the scapular. Other times she would cross her hands over her breast. Mary appeared 15 times predicting hard times for the French, preaching repentance, and looking to spread devotion to the scapular. Click here to read the messages of Pellevoisin. Estelle was dying of pulmonary tuberculosis, acute peritonitis and an abdominal tumor. On the 10th of February 1976, one of the doctors consulted, Doctor Benard of Buzançais only gave her a few hours to live. During the night of the February 14th, she claimed to witness the first of fifteen apparitions of the Blessed Virgin and was healed. On September 8, 1983, Monsignor Paul Vignancour recognized the miraculous cure of Estelle Faguette. No formal approval has been granted acknowledging the authenticity of the events at Pellevoisin either by the local bishop at Bourges or by the Holy See. However, numerous acts of secondary level of approval, including recognition of Mary's scapular request, have been given, encouraging faith expression at the site. 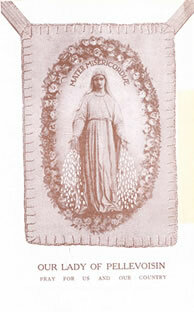 Pope Leo XIII approved the Archconfraternity of our Mother All Merciful of Pellevoisin in May 1894. Two Canonical Inquiries (1877, 1878) were conducted to investigate the apparitions. In the first, 56 witnesses were questioned (55 favorable, 1 indecisive) and in the second all the witnesses were favorable. Mgr de La Tour d'Auvergne died in 1879 before he had time to conclude the second Inquiry. Leo XIII by a Motu Proprio grants indulgences to encourage the pilgrimage to Pellevoisin on December 20, 1892. 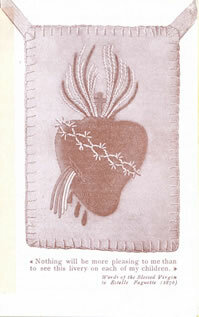 On April 4, 1900, The Congregation of Rites issues a decree on granting approval to the Scapular of the Sacred Heart. A Pellevoisin, un centenaire, Estelle vous parle, Pellevoisin 36500 Buzancsais, Monastere des Dominicaines, 1976, 112 p.
M. R. Vernet, O.P., La Vierge a Pellevoisin: Dieu au coeur d'une mere: Reflexion spirituelle sur la serie des 15 apparitions, dans lear mouvement pedagogique a I'egard d'Estelle a la lumiere dela doctrine du Concile, Paris, Tequi, 1978, 431 p.
O Mother of Mercy. Who dost offer to us the Scapular of the Sacred Heart of Jesus, and who dost desire that all thy children should be clothed with this holy Livery, penetrate our souls with the spirit of reparation and of penance, of which the scapular is the emblem and make us ardently love the Divine Heart, which has loved men so much, and is so little loved in return. Our Lady of Pellevoisin, Who dost love this devotion make all Christians the devoted apostles of the Sacred Heart, and lead them to pray with Thee for the Church and for our Country. Amen. when you had to go from door to door seeking shelter. Remember too what you suffered when Jesus was extended on the cross. I have confidence in you, O Mother of Mercy. If you will it, your Son will grant what I ask. Deign to listen to my supplications and repeat them to him. That he will grant me this grace ---- if such is his good pleasure, but may his will be done and not mine. May he grant me at least an entire submission to his designs. and that this will serve for my salvation and that of sinners. You possess my heart, O Mother Most Merciful, to do all that depends on me for your glory and that of your Divine Son. O Blessed Virgin, grant that I will imitate your obedience and that one day in eternity I shall, with you, possess Jesus. Téléphone : 02 54 39 06 49 ; Fax : 02 54 39 04 66.